Since this whole section of our documentation deals with customization, we’d be remiss if we didn’t mention that Method gives you the ability to create custom fields, and as many custom fields as you want within a table. Below shows an example of viewing the Class table within Method. 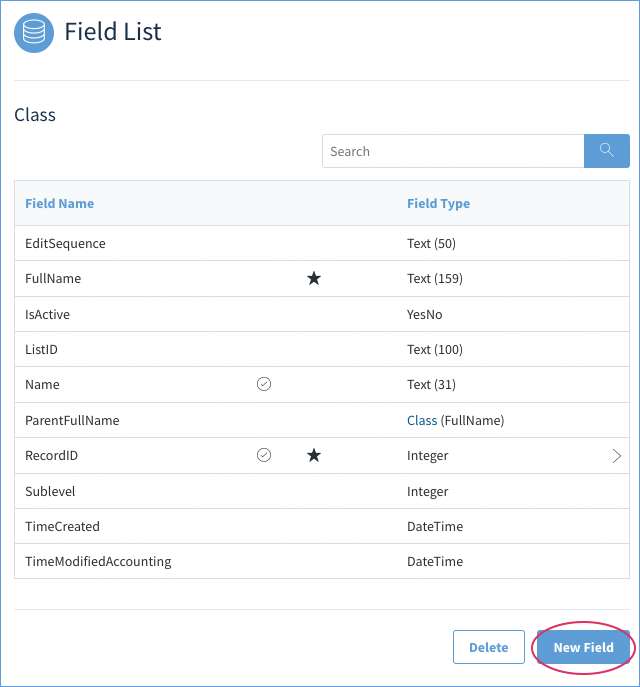 The fields shown in the Class table are the standard fields you would find in any Method account. However, at the bottom, you can create your own custom field by clicking the New Field button. It’s important to note we’re not talking about a custom field type because those are static. Remember when we said additional fields add value by providing more information about that record? Custom fields allow you to track additional details that might not be covered by fields offered through QuickBooks or Method, or even fields that might be typical to your industry. Here’s an example: let’s say you’re in business selling high-end shoes, and you use QuickBooks for accounting and Method for your CRM needs. There’s all sorts of information you might want to include in a customer record that neither Method nor QuickBooks accommodates - your customer’s shoe size, or maybe their shoe size in European sizing, or their preferred material - the possibilities are endless. Custom fields allow you to store that information in the table and reference it for each customer record. The idea behind custom fields is to give you the power to reference the information that’s most valuable to your business, and we’re not here to tell you what that is - we’re just here to give you the tools to make it happen! Method allows the creation of custom fields for the same reason we offer all our customization: we know your small business is unique, and a one-size-fits-all approach just won’t cut it when it comes to running things your way.